How does our smart fridge work? Better food for a better life. Now in the comfort of your office. Our cashless payment is designed to make everything easier for you. The best part is here! Enjoy your delicious food and savor your well-deserved break. Thanks to our domestic and international partners, we take pride in offering you a wide range of wholesome dishes, tasty soups, vitamin-rich smoothies, delicious energy boosters and refreshing drinks. Vegan, vegetarian or organic – there is something for every taste. Whether you need a quick snack or a nourishing meal, How I Like’s innovative fridges will give you exactly what you need at the tips of your fingers. 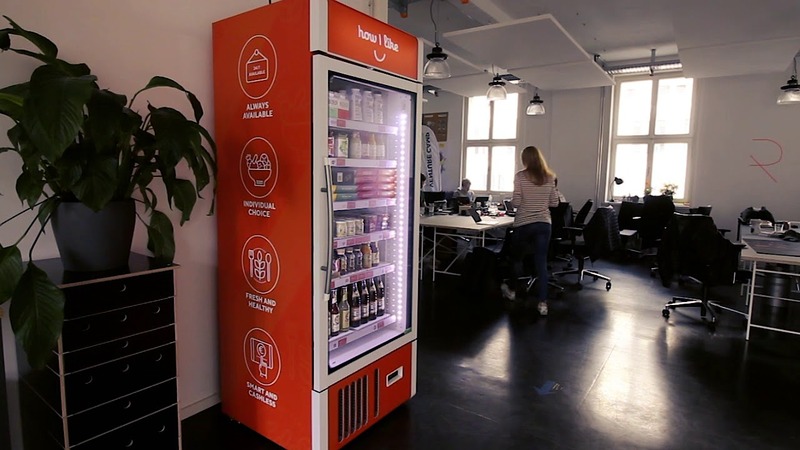 You want to use our smart fridge in your office? The development of How I Like’s intelligent catering system was funded by the European Regional Development Fund and the State of Brandenburg. First-class quality is ensured by regional and international producers, who constantly fill up our portfolio with fresh, healthy products. You want to know more about How I Like? Contact us now to learn more about our products and services.